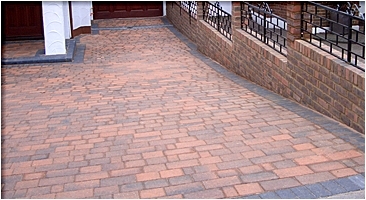 London Block Paving, serving North London, Hertfordhire and Essex for 18 years. "Just wanted to let you know how pleased we are with our new driveway. We did obtain two other quote's, but from the first meeting we knew London Block Paving where the company for us. Scot addressed all our concerns we had even with the new planning laws on water drainage. From the start to finish a thoroughly pleasant experience." 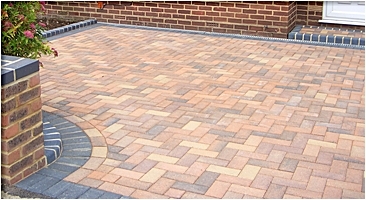 "I was emailed a very professional quotation from London Block Paving only one day after the initial appointment, they started on the day they said they would and completed my lovely new driveway a week later as stated, they even put new topsoil in the flowerbeds for me for free. I could not have asked for more. Can't see how you will not be impressed using these guys." "A big thank you to London Block Paving, I saw them install a new driveway in the next street and they looked a professional company, so it was an easy decision to have them build mine. Clean, tidy and professional at all times.Thanks again LBP." "Thank you, thank you, thank you for our stunning new patio, Scott put a lot of time and effort into bringing the different paving samples round, plus the design ideas really helped. The free Marshalls guarantee we received after the patio was finished gives us that extra peace of mind. Have recommended them to several friends already!" "As an electrical contractor myself I know how a job should be carried out, and London Block Paving carried it off perfectly, the equipment and machinery they have made the job look easy, a real professional set up! Will be a pleasure to recommend this company." "The new driveway London Block Paving have just completed for us using Marshalls Tegula paving, has transformed our home from an ugly cracked and uninviting approach into a stunning welcoming driveway which I'm sure has added a great deal of value to our house. Reaffirms your faith in builders after watching rogue trader programs on TV." London Block Paving Limited FREEPHONE 0800 955 2535 Call now for a quick estimate or appointment. 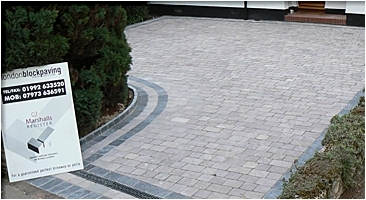 Driveway Companies Enfield, Tegula Paving Barnet, Driveways Whetstone, Block Paving Southgate, Landscaping Epping, Paving Designs Waltham Cross, Driveway Company Cheshunt, Drivesett Duo Hertford, Driveway Cobbles Broxbourne, Gravel Drives Hoddesdon, New Driveways Ware, Driveline 50 Potters Bar, Driveway Costs Harlow, Marshalls Paving Cuffley, Sandstone Goffs Oak, Vehicle Access Loughton, Dropped Kerb Woodford.